Notice with the passing of retired Delta pilot captain Edward Herbert Finkbeiner, age 82. 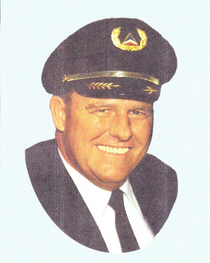 (*our sources indicate DOB 06-27-1935, but I see other sources that mention DOB 01-27-1935) Captain Finkbeiner joined Delta Air Lines 03-04-1964 and retired with Delta based 030/ATL. He is survived by his wife Barbara. 1535 Waterwood Drive, Lutz FL 33559-6909 ... (813) 909-7190. Memorial services will be held tomorrow July 1st at noon, at St. Clement’s Episcopal Church in Tampa, Florida. Arrangements entrusted to MacDonald Funeral Home, 10520 N. Florida Ave., Tampa, FL 33612....(813) 933-4950.